The recent election results will have a significant impact on the Canadian grants and incentives landscape. The new Liberal government has committed to significant increases over the next two years to infrastructure spending, skills training, agri-food, green infrastructure, public transit and jobs and innovation. The majority of these new government funds will be delivered through a competitive granting process, where only the best projects are funded. Therefore, it is now more important than ever to understand the nuances and machinations of the various government Grants & Incentive programs along with how your business or municipality can access and utilize these funds. The following article is intended as a quick reference guide for you to gain an understanding of grants & incentives. What are Government Grants and Incentives? Government grants and incentives are non-repayable funds that the government has allocated specifically to benefit the public, often with the goal of growing the economy and creating jobs. Grants exist where there are spillover benefits outside of your organization. It is tempting to think of grants as found money, but instead they should be considered an investment in fostering and developing Canada’s competitiveness on the global stage. Succeeding on a grant application is hard work – if it wasn’t, every project would get funded. Your project must be a solution to a particular problem or a response to an identified target result. These funding agencies need to allocate these funds. But investing isn’t gambling. They want to be assured you can deliver before they approve your application. This is the most important step in the process. It’s at this point where we determine whether or not a good project exists. Before anything is written, make sure all requirements are identified and you’re well informed on the program’s intentions. Educate yourself on the ins and outs of the mission and values of the funding program. The application is only competitive if it demonstrates solutions-based outcomes that align specifically with the funder’s goals. 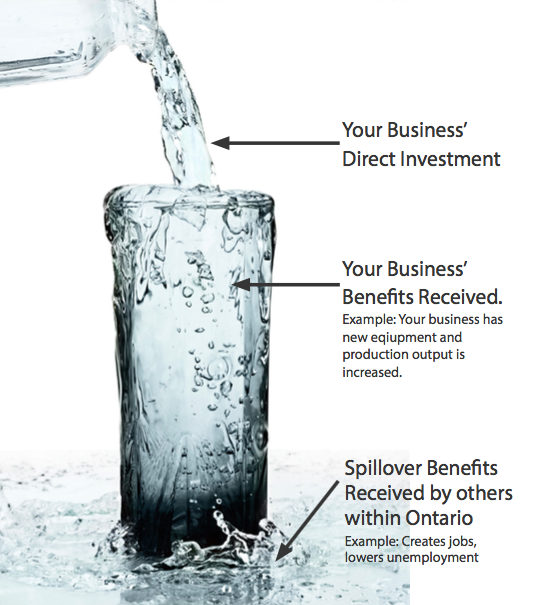 If you are a manufacturer based in the GTA, obviously don’t apply for the Rural Economic Development Fund. Instead, your time would be better spent looking at programs like CME-SMART or AIME. If you have a really promising idea that can turn into a really good project, start putting your plan together. Assume a leadership role and start building a game plan. Identifying relevant grants and applying to them successfully is a collaborative process. Get organized and identify the high priority items and what’s missing from those priorities. You want to build consensus with your colleagues and have the confidence of your stakeholders. You need a clearly defined project. Don’t invest time in ideas that aren’t promising. Perform a cost / benefit analysis and identify the types of costs (operational, capital, in-kind) and the amounts. Then identify a timeline for the project. If this can’t be done yet, step back and gather more information. Continually assess throughout the planning stage. Assess your capacity to deliver; assess the project’s costs/activities; assess your own funding commitment to the project; assess the project’s feasibility. Keep asking yourself if you would fund the project, if you were the funding organization. Energy and excitement are great, but the grantors want to see hard numbers. Capacity to deliver: Do you have the expertise and resources to deliver results? Project Costs / Activities: Have you developed a preliminary budget? Have you engaged suppliers and do you have quotes? Do you have letters of intent from interested customers? Do you have a list of milestones and a reasonable timeline to reach them? Funding Commitment: How much of your own capital or other outside funding can you commit to the project? The grantors want to see that your organization is just as committed and invested in the project. Are there other sources of funding that you will also access? Feasibility: Is your plan realistic and achievable? Once you achieve the project’s outcomes, will you be able to sustain the project? Good grant writing involves good storytelling. Storytelling is one of the oldest forms of communication, but it is underutilized in high-level business communications. If you want to convince the funder on the suitability of the project, you must provide a compelling storyline. Write in a clear and concise manner. Avoid using excessive technical jargon. Put yourself in the mind of the grantor: they are reading several applications, so make yours as easy to read as possible. At the first sign of difficulty, most people stop reading, or at least stop paying attention. Keep it simple, easy, and interesting. Write with the confidence of an expert, but write for a non-expert audience. Creating immediate interest is crucial. Start with a compelling name. Keep it concise, outcome-focused, and attention-grabbing. Make your title and introduction unique. Follow up on the interest created by providing social proof; demonstrate past achievements, expertise, and ability to collaborate. Good writing is the result of re-writing. Take the proposal through a few drafts and make sure several sets of eyes have a look. Remember: funders want to provide funds to worthy applicants. The goal is to make your project the most attractive one. 90% of the time will be spent in preparation. Know the funding agency’s mission, vision, and the goals behind the funding opportunity. Know the project: invest in good ideas and clearly define and outline all of the costs involved with a reasonable and feasible timeline of milestones and deliverables. Write the proposal, and then revise, revise, revise. Give the project a compelling title to trigger interest, assess expertise, capability and funding commitment to demonstrate social proof, and a solid game plan to appeal to logic. Do all of these things and there will be an excellent chance for success! Not sure if your organization qualifies for government funding? Contact us today for a free assessment.